On March 17th, the Irish, the more than 70 million world-wide who claim Irish heritage, and the Irish-for-a-day, will be lifting a pint of Guinness, or something stronger, to toast Saint Patrick, the patron saint of Ireland. I bet corn beef and cabbage will be on many a menu. And many will be wearin’ the green. Why is it celebrated on March 17th? One theory is that is the day St. Patrick died and is now celebrated as his feast day. 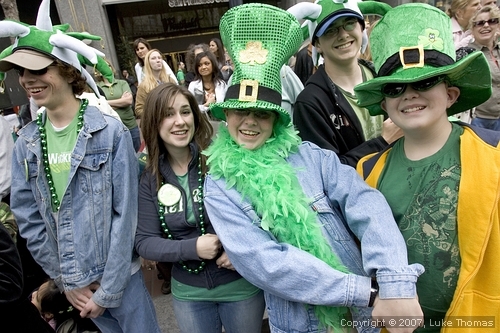 San Francisco’s 159th Annual St. Patrick’s Day Festival will be held on Saturday, March 13th, 2010 at Civic Center Plaza, from 10:00 a.m. to 5:00 p.m. The Festival takes place at Civic Center Plaza and on Grove Street, from Polk to Larkin Streets. The Parade will be held on Saturday, March 13th at 11:30 a.m. The Parade begins at the corner of Second & Market Streets, and continues on to City Hall.